This text is all about the Apache helicopter. I wrote this article because the Apache the most popular helicopter in this game. And if you are interested in the reason why, please read on. The Apache is designed and utilized by the biggest military force in the world, America, along with some other countries. You can see this helicopter nowadays in Iraq, Afghanistan and in the Israeli-Palestine conflict. It's designed role is to hunt for tanks. It's equipped with night vision, infra-red camera, radar, head tracking canon, laser and devastating missiles to do this job well. The major advantages of a helicopter is to fly nap of the earth (very low) and to hover behind hilltops, this is called "natural stealth". It can pop up behind the hill and start its devastating attack. Fighters would use radar to track down targets, but that will also reveal there presence. 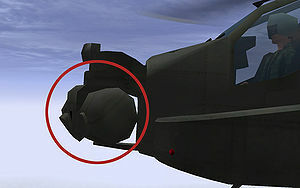 An attack helicopter is using cameras to acquire targets and leave the radar out, for not revealing it's presence and position. At the moment of engagement the hunted are overwhelmed by the surprise attack, and within seconds these opponents can be entirely wiped out. The situation could be even worse for them. The Apache has the ability to shoot targets on the other side of a hill without even popping up behind that hill. This is pretty much what an attack helicopter is designed for. While nowadays it's not likely the Apache is facing high threats (like anti aircraft artillery, tanks or jet fighters), but more likely soft targets (most often insurgents). It observes insurgents from a distance and take measures against them if required. By this it can support ground forces to help them advance. Or provide great gun power in a such a situation. 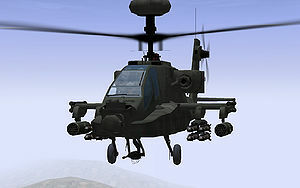 One of the two most prominent weapons of the Apache is the anti tank missile (ATM), the Hellfire. Anti tank missiles are not designed for speed, but for armour piercing power to blast through the hull of a tank. Hellfires and Apaches are like are strongly bond together. The other prominent weapon is the powerful cannon. This cannon can aim freely in different directions. It has 30 mm rounds, which are quite powerful in use. The cannon is best used with the camera abilities of the aircraft. It can immediately attack the spot where the camera is currently aiming at. Or it can be slaved to the gunner's head movement. In this situation where the gunner is looking at, the cannon is as well. With this, it can easily "mop up" smaller targets in close proximity. The rockets used by the Apache are unguided. 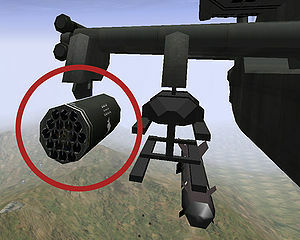 There name is Hydra rockets and can stowed away in a 19 round rocket pod. These rockets can provide extra blasting power at close distances (±700 m) without spending expensive Hellfires for a target. But they can also be used as "areal artillery" at larger distance (like 3 km). The dispersion rate is its weakness. Stingers, the Apache's air-to-air missiles (AAM), are short range, high maneuverable missiles. It's range is limited, it can reach targets within the 5 km range. Its primarily added to the aircraft to defend it against incoming fighters, by counter attacking them. Though with speeds up to Mach 2 (662 m/s), fighters have passed 5 km in 12 seconds! So handling speed is vital in these kind of situations. Keep out of sight is always the best thing to do. Stingers are seldom efficient by using one at a time against dozens of flares of the attacking aircraft to spoof it. It can be considered a cheap and wasteble missile, as a small priced live saver. The Apache has several ways of acquiring targets. 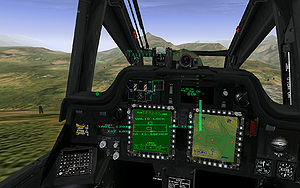 Most prominent for the Apache is the TADS or "electro optical system" (EOS), located in front of the fuselage. It has 2 cameras, one infra red and one based on daylight imagery. The latter is like a common known camera, only with a extreme zoom capability. The first sees heat imagery in shades of green. This is very useful during night missions. Helmet mounted sight (HSM) is likely the most genius target designation system. It is like controlling the gun aim by your the head movements. This slavery behavior of the gun allows the gunner to aim exactly where he's looking, comparable with first person shooters. It's a convenient method to suppress close proximity targets at gunpoint, like FARPS. The radar is a big system for target acquisition. It sure can acquire targets, but the broadcasting of radar signal could notify the enemy of your presence and therefor not fit for most situations. 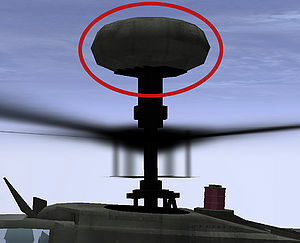 The radar has air and ground modes, which cannot be used at the same time. The distance and observability of a target has great influence on radar distinction capabilities. 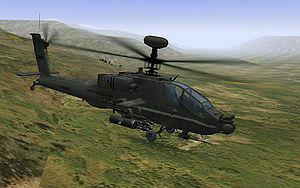 The Apache is designed purely as an attack helicopter. This means it is not equipped with great array of defensive countermeasures. Being unseen is the Apache's major advantage. With this it can surprise the enemy in attack situations and get away unharmed in defensive situations. Beside this, it sure needs defensive equipment. It has 2 jammers (IR jammer and radar jammer) and 2 disposable countermeasures (chaffs and flares. 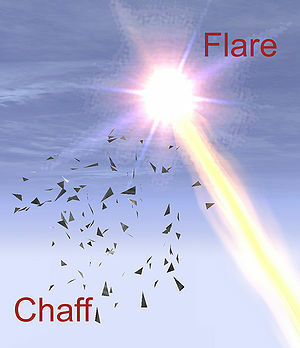 Chaffs is a decoy item for radar homing missiles. Instead of aiming for the aircraft it alters its path to the chaff bundle. Works like chaffs, but this time for heat seeking missiles. A flare is a hot disposable item, so heat seeking (IR) missiles are adjusting their aim towards the flare and away from the engine exhausts. 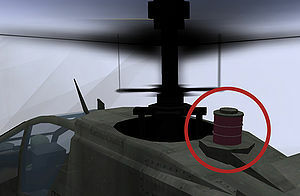 It's a device that broadcast a strong radar signal, so that radar seeking missiles are blinded by the strong signal. New radar missiles (like radar Hellfires) can switch to "home-on-jam". Works much the same way as a radar jammer, but only this time it radiates high intensity IR beams. These beams are radiated inadvertently in all directions, and therefor it's called IR "disco light" jammer. The name Apache is derived of an American native Indian tribe. Also the Comanches were such a tribe. The AH-64A stands for "attack helicopter number 64 version A". The Blackhawk, for example, is a utility helicopter and therefor called UH. The Cobra has been the first attack helicopter out there, AH-1. Not all numbers are related to existing helicopters, most of them are probably stranded somewhere in a development stage. The Apaches full production started in the first half of the 80s. And it got a major overhaul about 5 years ago. 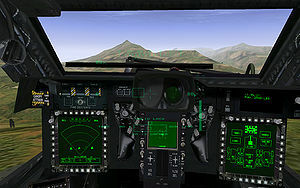 The first Apache version (A-type) had analog cockpit gauges. The B and C type were development types and never hit the market. Currently most A-type Apache are upgraded to the D-type. The D-type got some major additions, like digital displays in the cockpit and radar capabilities. Most of the analog dials and gauges are now covered by MFD pages. The biggest addition is the radome (radar dome), seen on top of the aircraft. The Apache has now the ability to acquire targets by radar. The new Apache can also interchange battlefield information (e.g. target positions). During the lifetime of the Apache the Hellfire system got an update as well. The first Hellfires were laser guide (K-type), the new are radar guided (L-type). This has several advantages. 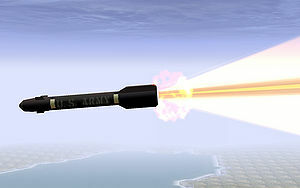 First, a laser guided missile need constant "painting" of the target, thus the Apache is exposed by this reason. Secondly, the radar variant is "fire and forget", thus the Apache can focus on new targets after a missile launch. But there's still one major advantage for the laser Hellfire, if properly painted, a target can hardly spoof the system and a hit is almost certain. This page was last modified on 2 March 2008, at 13:31.